circuitbent easy button from nikkipugh on Vimeo. This workshop will guide you through the basics of soldering and the sometimes-a-bit-tricky steps needed to modify the toy’s circuit. At the end of the workshop you’ll have an ‘improved’ button to take home with you. Prior experience of soldering isn’t necessary, but a high tolerance of beepy noises is essential. All workshop materials will be provided. Helpers from the fizzPOP hackersapce will be around to assist. Nikki Pugh is an artist interested in interactions. It turns out she also likes beepy noises. 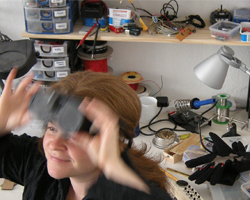 She co-founded the fizzPOP hackspace in 2009 and has been organising events and workshops introducing others to fun and creative applications/deviations of technology ever since. Nikki uses her rudimentary understanding of electronics alongside her skills in taking things apart to do things like things like mapping the built-up-ness of New York, experiencing the sonar-navigating abilities of migrating whales and giving people vibrating bundles of bubblewrap to take into the alleyways of Digbeth.